A breath of fresh air in London is often hard to find. Yet up above the rooftops of the city, gazing out across the urban silhouette you can enjoy some truly serene moments. Where could be more perfect then, for a London Wedding than a rooftop venue atop this beautiful city? 30 Euston Square combines the grandeur of a Grade II* listed Victorian Building with a stunning modern events space. The State Rooms and Rooftop Terrace at 30 Euston Square are a fabulous space in which to host ceremonies and receptions. During the day, the State Rooms are flooded with natural light, keeping the space bright and airy while the balcony provides a gorgeous outdoor drinks space, especially during the summer. On summer evenings the venue basks in the glow of orange skies as the sun sets over London. The space is incredibly flexible, thanks to the roof terrace’s position adjoining the State Rooms. 30 Euston Square can accommodate weddings of all sizes from intimate ceremonies up to standing receptions for 230 guests. If you’re planning to dance or feature entertainment, the rooms enjoy fully integrated AV equipment or you can bring in your own. You can rest assured that you’ll be able to celebrate in the most spectacular fashion. 30 Euston Square strives to meet every need their clients have in both the flexibility of the space, their exceptional service and the menus their catering can provide. Renowned caterers Searcys are responsible for the management of this spectacular venue and their culinary excellence is certain to delight you and your guests. 30 Euston Square’s executive chef, Daniel Broughton, has created classic menus of cosmopolitan origin. His modern influences as a chef are the perfect complement to the blend of tradition and modernity that 30 Euston square embodies. As part of the exceptional service you’ll recieve to help you through your wedding day, a dedicated wedding planner will assist you at every step. You’ll be that much closer to a stress free wedding day thanks to their expertise, allowing you to focus on enjoy the day. Thanks to the flexibility and experience of the events team at 30 Euston Square, they can easily accomodate bespoke styles and wedding themes, helping you realise your wedding dreams exactly. Hosting your wedding at 30 Euston Square promises a spectacular day, creating unforgettable memories. 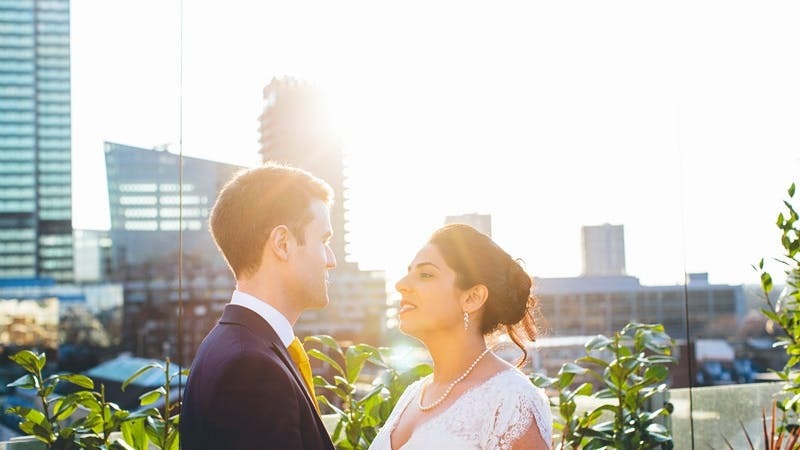 You'll enjoy a bespoke exerience that realises every detail of your wedding dreams as you experience all the joy and happiness a wedding brings, looking out across the rooftops of the London skyline.